Howdy! If you found this, you’ve found my personal repository of all things Gun Dog Comics, a comics and pop culture store that I founded with my baby brother, Steve, way back in 1988. Look: Don’t take any of this information and commentary as how to run a comics chain, and make sure you ignore the comics publishing advice! Remember, we sold all our stores by the end of 2001 and as a publisher we were pretty good comics retailers. All in all, I’m pretty happy with how things turned out, although I miss being surrounded by comics all day. (Written sometime in 1999-2000) We started Gun Dog Comics by accident. 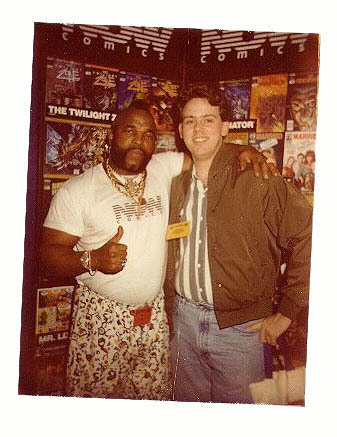 In 1983 (while in high school) My brother and I started buying wholesale from a local convention dealer with the intent of starting to sell at shows. We contacted all of the distributors for information about opening accounts but the minimum order requirements were too high for two kids with no capital. In 1988, I was in college and we had a college rock band. When we moved the group up to Starkville, our insurance agent said that we needed a secure place to practice - not a little rent-a-space in a tin building - if we wanted coverage. We did. It worked like gangbusters. Within a week or so we were selling more comics than dog food, and instead of taking down the sign that just said GUN DOG (not Gun Dog Supply), we just started calling the business Gun Dog Comics to save $100 on the sign. I graduated from Mississippi State 18 months later (May 1990). We moved into another retail location a LOT closer to campus (La Galerie Shopping Center) and sales instantly tripled (from nothing to a little something). My brother graduated two years later and we opened our second location in Columbus, MS. We then opened 3 more locations over the next three years in Tupelo, Jackson, and Hattiesburg, and closed the weakest link in the chain (Columbus) in 1996. After the 1993 crash looked permanent in 1996, we decided not open more comic stores, nor to diversify our product mix any more, but to actually start new businesses to diversify our income streams. In late 1996, we NEARLY bought a hair salon where my sister-in-law worked. The owner was moving, and we could walk in and pick up a $6,000 a month PROFIT stream (mostly cash) for assuming the owner’s $20,000 note. No money down. Unfortunately, the landlord wanted the building back and that killed the deal. Then we looked at starting a paintball field, or renting computer time for network games. No luck.